Northern Virginia can be a frustrating place to live. The DC Metro Area is home to constant traffic, a very high cost of living and wall-to-wall people (just turn on your news this weekend to watch the swarms of people here for the presidential inauguration!). But Northern Virginia is also full of hidden gems, my favorite being interesting local restaurants and ethnic stores. Lost Dog Cafe is a neat local sandwich and pizza place with a large selection of beer. The owners also established a foundation dedicated to rescuing stray cats and dogs. My favorite sandwich at Lost Dog is called “Muttly.” The Muttly is a warm pita full of spinach, chicken, provolone, tomatoes and pesto. Because I’m a picky eater and always trying to figure out new things to tolerate for lunch, I really wanted to recreate this sandwich so that I could enjoy it more frequently (and, of course, cheaper). The outcome was great. 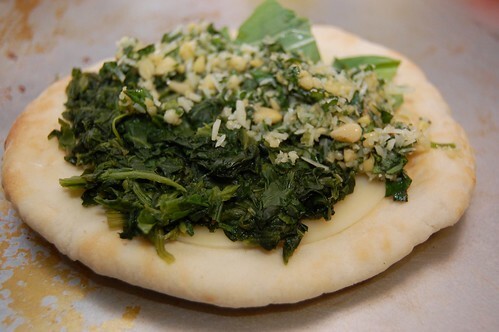 Make sure you buy large pitas; mine were a bit small so I wasn’t able to pack in as much spinach as I wanted to. I made the pesto from scratch, which always beats adding more ready-made, processed food to your diet, but the recipe I used was time-consuming. To cut down on time I didn’t chop it quite as much as I should have. I hope you will forgive my “lazy” pesto. Please note that this is not a spicy chicken wrap, a Cajun chicken melt or a chicken sandwich smothered in tangy ranch dressing. I seasoned my chicken generously before baking it, but the flavor is mild (though not bland) and it’s not dripping with any condiments. I love this about the sandwich, but I just wanted to warn you not to expect something like Panera’s Chicken Bacon Dijon calorie festival. Happy lunching! 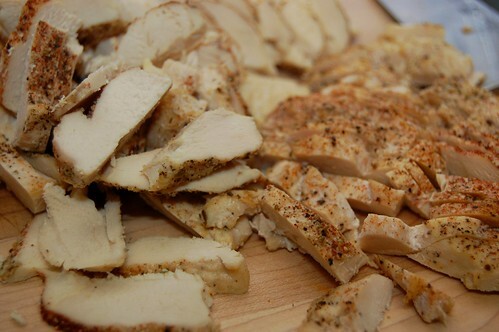 Preheat oven to 375 F. Cut your chicken breasts in half so that they resemble chicken cutlets. Sprinkle the bottom of a 13×9 baking pan with 2 tablespoons of white wine. Arrange the chicken pieces in the pan and season generously with paprika, salt, pepper, Montreal chicken seasoning and cayenne. Bake the chicken for 25 minutes. In the meantime, chop tomato and set aside. 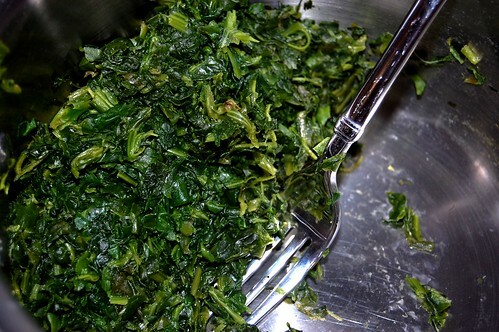 Cook package of frozen spinach according to package instructions and set aside. To make the pesto, you can find some great instructions at 101 Cookbooks. Mine didn’t turn out as authentic or attractive because I don’t have a mezzaluna, but the pesto was fine for me and used less oil. 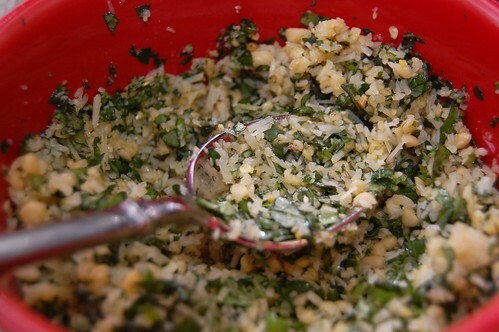 I basically followed this recipe except I chopped it until it was minced, not finely minced (because all that chopping took 101 Cookbooks thirty minutes, and that didn’t sound so great to me!). I would also recommend adding a bit of salt to the recipe. When the chicken is done, allow it to cook enough that you can handle it comfortably (leave the oven on). Slice the chicken into bite size pieces and set aside. 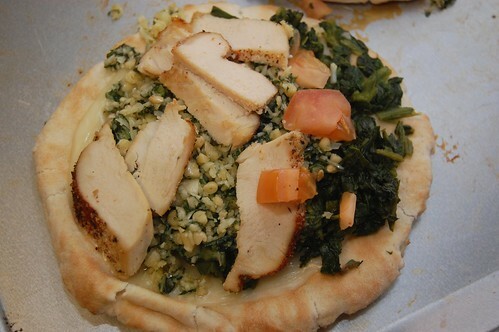 Arrange the pitas on a baking sheet and add one slice of provolone followed by some spinach, pesto, chicken and tomatoes. If your pitas are malleable, fold it over like a sandwich (without breaking the pita). When you’re finished putting together the sandwiches, set the baking sheet in the oven for approximately 5 minutes (just until the sandwiches are warm). Remove tray and serve! Wrap tightly and store any leftovers (we had leftover sliced chicken and pesto in addition to leftover sandwiches). I want this NOW. This, like everything else you’ve made, looks amazing! Meghan – Thanks so much! I really enjoy this sandwich and was happy it turned out so well. Hope you have a great weekend!